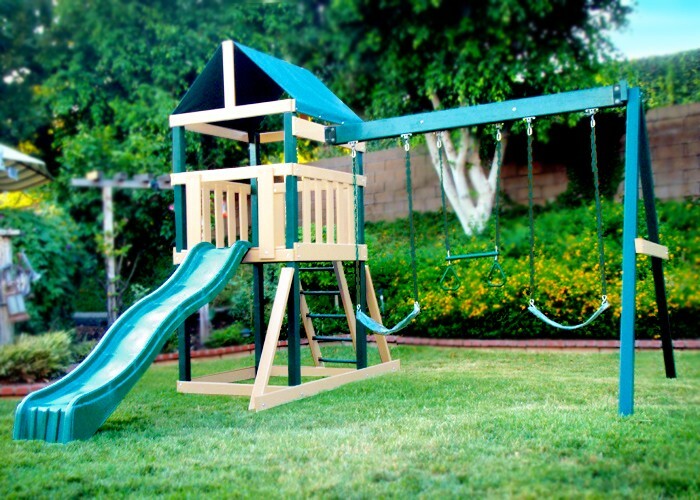 Maintenance Free Lumber 100% Polymere Coated Swing Set is Splinter Free. 4' x 4' Fort with 4ft Deck Height. Natural Green and Brown Color blends well with the Environment and is HOA friendly. This is Backyard Fun made easy for everyone! This swing set Lumber is pre-cut, pre-drilled and ready to assemble. The playset comes complete with all hardware and easy to follow instructions. Built with maintenance free Polymer coated lumber, guaranteed for 10 years. Dad will Never have to sand, refinish or paint, The lumber will not chip, crack, rot, peel, or blister. Just clean up easily with water and bio-degradable cleaner like Simple Green. Conforms to ASTM standards for Residential Playground equipment. Maintanance Free Lumber 100% Polymere Coated Swing Set is Splinter Free. 4' x 4' Fort with 4ft Deck Height. Natural Green and Brown Color blends well with the Enviroment and is HOA friendly. This is Backyard Fun made easy for everyone! This swing set Lumber is pre-cut, pre-drilled and ready to assemble. The playset comes complete with all hardware and easy to follow instructions. Built with maintenance free Polymere coated lumber, guaranteed for 10 years. Dad will Never have to sand, refinish or paint, The lumber will not chip, crack, rot, peel, or blister. Just clean up easily with water and bio-degradable cleaner like Simple Green. Conforms to ASTM standards for Residential Playground equipment.